There are more than 100 stages in the manufacture of a Sheffield pocket knife. The hands-on, labour intensive process requires skill and attention to detail. As seen in the video below, making a 2 blade knife is all the more complicated with twice the number of moving parts. Pivot pins and handle rivets are still peened using hammer and anvil, despite machine presses being avaialble for this job. Final securing of the pivot pin through the bolsters is particularly delicate. This involves the use of a metal spacer to gauge the tightness of the joint. The final result should allow smooth blade opening and closing, without any appreciable side to side blade play. Die-stamping has replaced hand forging of blades, although the secondary blade bevel is still formed by hand. 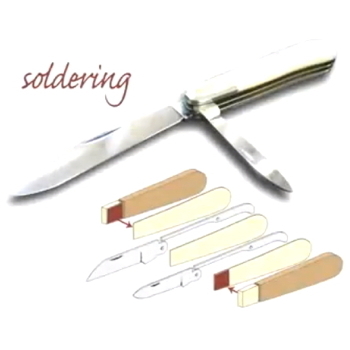 The second video below follows the making of a single blade Barlow knife with custom file-worked back spring. This shows how the unique file working of the back spring is achieved with a combination of machine grinding and hand applied file-work. Water cooled grind stones, belt grinders and buffing wheels are also used to produce a mirror polish finish. 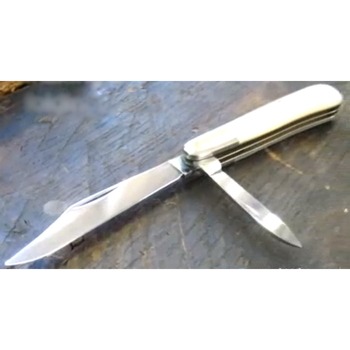 The cutom made, 2 blade pearl handle pocket knife is made by Taylors Eye Witness, Sheffield, England. 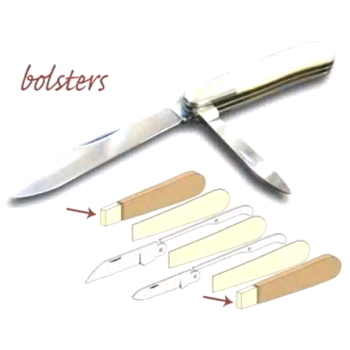 Bolsters are cut from nickel silver stock and formed into shape by hand filing. Handle liners are cut from brass sheet stock and 'dished' using a press tool. This ensures a flush fit when the handle scales are rivetted on. The nickel silver bolsters are soldered on to handle liners by hand and smoothed off using a belt grinder. The handle liners and bolster sections are polished on a buffing wheel before the handle scales are fitted. The pivot hole is drilled through each of the bolsters and liners. The outer side of the pivot hole is widened using a long taper drill to accomodate flattened ends of the pivot pin. Long tapered drill holes are made through the handle scales and these are pinned on to handle liners using softened nickel pins. After pinning to the handle liners, excess areas of the handles scales are trimmed off using a belt grinder. All sections of the handle are assembled, including 2 outer halves, middle handle liner, springs and blades. A solution of engine oil and chalk is used to lubricate the blade pivot areas during assembly. Pivot pin is fitted using a metal spacer, to prevent over tightening.